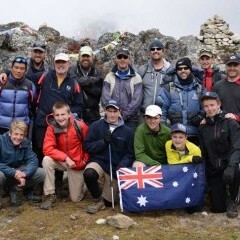 Andrew Stace who is also a teacher at the College and has spent a lot of time exploring the hills of Nepal. important for people to experience. We all get caught up in the day to day of life and to step back and enjoy new sights and to go on a journey with family is an opportunity that might otherwise get skipped by. The group spent a couple of days in Kathmandu before the trip, taking in the sights, doing their last minute shopping and relaxing before heading to the mountains, flying into the infamous Lukla Airport. up to the base camp with some of the best views of the Himalayas and Everest taken in from this point. After the trek, some of the group travelled to Chitwan National Park to spend time in the jungle, others went bungy jumping and some chose to relax in Kathmandu. We again thank Prince Alfred College for their ongoing support of HDFA and look forward to this relationship continuing into the future. If you would like to organise a trek into the Himalayas in support of HDFA please contact us and we would be more than happy to help you make this happen!